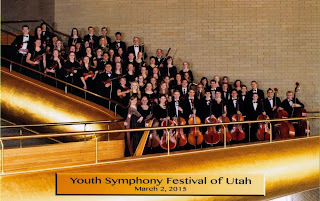 The Northern Utah Youth Symphony and Chamber Orchestras are pleased to announce their Season Finale Concert, Thursday, April 23, 2015, at 7:00 pm in the Box Elder High School Auditorium, 380 S 600 W, Brigham City. This FREE concert will feature timeless classics, crowd-pleasing pops music, and Travis Seamons, a winner of this year's concerto competition, performing the Shostakovich Piano Concerto No. 2. The Northern Utah Youth Chamber Orchestra, a strings training orchestra directed by Amanda Kippen, will open the concert with Meyer's Curse of the Rosin Eating Zombies from Outer Space, and arrangements of Billy Joe's Boulevard of Broken Dreams, Holst's Jupiter, and Offenbach's Orpheus in the Underworld. The Northern Utah Youth Symphony, a full symphony orchestra directed by Conrad Dunn, will perform the first movement of Schubert's Unfinished Symphony, The Hoedown from Copland's Rodeo, and the first movement of the Shostakovich Piano Concerto No. 2 with Travis Seamons. For the finale, the two orchestras will combine to perform Elfman's Selections from Charlie and the Chocolate Factory. Travis Seamons has been playing the piano since he was eight years old. Music has always been his passion -- he is the NUYS principal Oboist -- but playing the piano is especially important to him. He has participated in Utah State University's (USU) Youth Conservatory for the past four years and is currently studying under Dr. Kevin Olson. Playing the piano has been a major part of Travis' life. Some of his awards include Superior ratings at State Solo and Ensemble and Honorable Mentions at USU's annual Piano Festival. He also performs frequently within the community. When he isn't playing the piano, Travis loves science and math. Last fall he took first place in science at the Academic Olympiad held at USU. Following high school, Travis will serve an LDS mission in Budapest, Hungary. He will then study biomedical engineering at either USU or the University of Utah.